Come see an awesome electronics demonstration by our Swiss CMU Professor member Luc Berger. 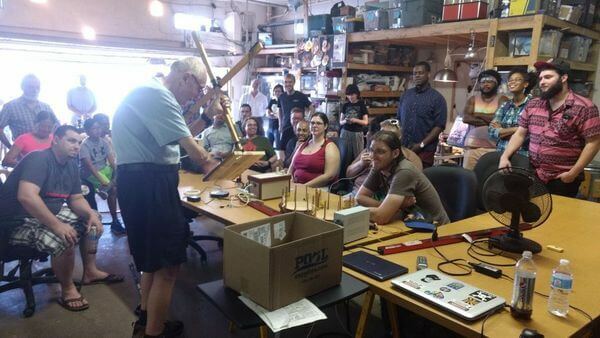 His demonstrations are always extremely popular, unusual, and interesting. Its the kind of stuff you wish Physics teachers did more of in school. • This demonstration starts with a simple review and explanation of LEDs and phototransistors. • Alexander Graham Bell invented the PHOTOPHONE in 1880. The light-sensitive material was selenium. • We demonstrate homemade transmitting and receiving equipment which uses infrared light. • To conclude the session, we show how an ordinary laser pointer can be modified to communicate with red light. • Because of the narrow beams of light, the techniques described here are more secure than radio.